Ian Andersen made a brief stop in Prince Rupert in the early stages of his 10-month journey from the top of North America to the bottom of South Amercia. He is cycling to raise awareness for spinal cord injuries and disabilities. Many adventurers have stopped off in Prince Rupert during their epic journey either on paddleboards or a sailboat and the latest is a cyclist traveling from the tip of Alaska to the tail of Argentina. 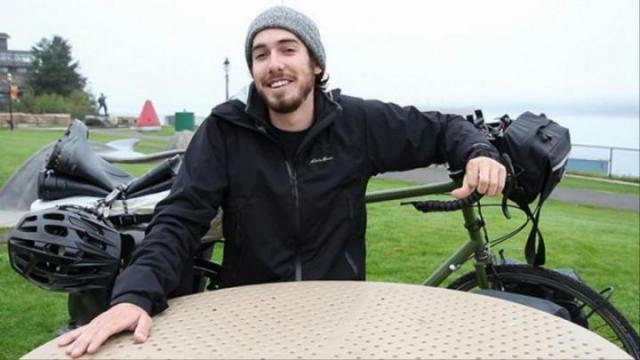 Twenty-four-year-old Ian Andersen is on a 10-month voyage to ride the 28,165km down the North and South American continents. His purpose is double edged, to raise awareness and funding for spinal cord injuries and disabilities, and to follow his uncle’s route 30 years later. Andersen arrived in Prince Rupert via ferry from Haines, one of the rare breaks he’ll get in the next few months. “It’s a mini vacation until I hit the road again in Vancouver Island,” said the cyclist who only did one training ride before he embarked on his trip. Every town or city he passes, he shares the story of his friend, Natalie Fung, who is paralyzed from the chest down after a drunk driver hit the taxi cab she was in. Andersen’s goal is to raise more than $1 for each mile he rides, or at least US$20,000. “I’m pretty much doing the trip for her in her honour and to bring awareness to spinal cord injuries. The idea, hopefully is within a few decades we can work towards a permanent scientific solution and help these people long term,” Andersen said. Only three weeks in and he has already raised half of his goal. “When you’re riding you don’t know who you might affect with your mission,” he said. The other purpose of the ride is to follow in his uncles’ tire tracks. In 1986, Bret Andersen, in a team of four, did the same route over a 10-month period and set a Guinness World Record for the longest continuous bike trip. “This is the 30th anniversary of his ride. Now, I say it’s tradition. He did it, now I’m doing it. Maybe my nephew or son will do it one day,” Andersen said. The best piece of advice his uncle gave him was to wrap plastic bags around his feet to stop the wind from chilling his feet — advice he’s already put to use in the north. With only 45lbs loaded on his bike, and a pair of gum boots strapped on top of his tent, Andersen keeps it simple. Up until this point, the cyclist from Minneapolis, Minnesota has seen bears, moose and muskox around the Arctic Circle. One morning he woke up to the sound of shuffling outside his tent. He unzipped the tent and was surrounded by a herd of dall sheep. He counted at least 25 of them, grabbed his camera, and started shooting. People have been incredibly kind to Andersen when they see him on the road. He’s been offered bananas, a refill of water and kind words from strangers. Follow the rest of his adventures at www.ridewithian.com.